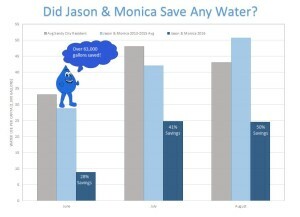 Accidental Conservationists Jason and Monica were pleasantly surprised recently when their water bill arrived. It showed the new amount for their level-pay arrangement. Their monthly bill had dropped by $30! “That’s enough to pay back the $300 we invested in our sprinkler system in 10 months,” Monica said. She credits the EPA WaterSense-labeled sprinkler controller and the needed updates to their existing system for the payment drop. In earlier blog posts—“Meet the Accidental Conservationists” and “The Accidental Conservationists, Part II”—Jason and Monica told how they took advantage of the Central Utah Water Conservancy District’s rebate plan to purchase the sprinkler controller, which promptly killed their lawn. It was like putting a Tesla engine into a Model T and expecting it to drive like a luxury car, Monica explained. With the help of their local home-improvement store, they made the necessary adjustments. To mangle a popular idiom, the proof is in the billing. “We cut our water use by 38 percent in 2016,” said Monica, who calculated and compared use over the past three years. “In July alone, the hottest July on record, we saved 50 percent!” The biggest cuts in use, of course, will show up in the lawn-irrigation months. For example, Jason and Monica saved 63,000 gal. of water from June to August. But the savings will add up all year long. “Once we straightened out our sprinkler system, our lawn was greener than it had ever been,” she added. She and Jason live in a home built in the ‘70s and the sprinkler dated back to that decade, too. It threw a lot of water on the grass but didn’t really nurture it. She is hopeful that people can learn from her experience. That way, they can find out ahead of time what is needed to fully achieve potential savings. Although there is no rebate program in place right now–its popularity dried up funds for the fiscal year–there are other things you can do cut your irrigation water use once spring rolls around. Try the tuna-can trick: Put an empty tuna can on your lawn and watch how long it takes for your sprinkler to fill it. That’s the length of time you should use to program your sprinklers for optimum irrigation. You can also purchase a small tool that, when attached to the water spigot, measures water pressure. It costs about $5 and will help you see where changes are needed. EPA WaterSense-labeled sprinkler controllers are still on store shelves. If you’re as lucky as our happy Accidental Conservationists, it won’t be long before your savings pay off.